So much power was wielded by the abbots that the development of any independent town government in Glastonbury was stifled during the middle ages. However, many administrative roles were carried out by St John’s churchwardens, elected each year by the Vestry together with the town's overseers, etc; they were consequently uniquely incorporated and granted a seal. Part of the income they administered came from a large number of properties owned by the church. These included cottages built in the churchyard — those along its High Street frontage probably started life as market stalls, occupying commercially valuable positions close to an important market. 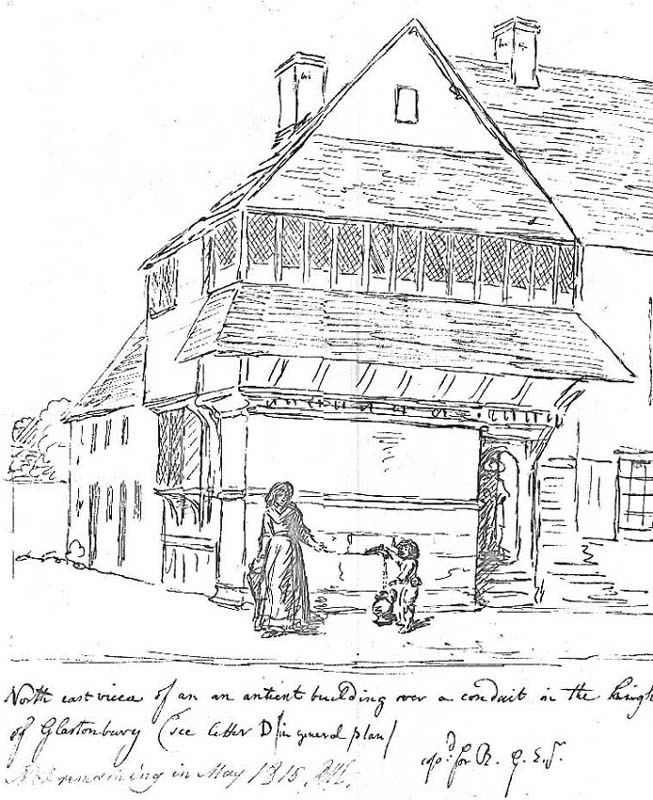 The facilities available in St John’s church were insufficient for the work of the churchwardens so they built a Church House opposite in the High Street. The Church House was adjacent to the Abbey gateway leading directly to the Abbey church’s main entrance and was at the top of the Market Place. It's frontage was built over one of three major medieval High Street water conduits; this was still one of the main sources of water in the town until the 19th century. The Church House was used for brewing Church Ale and for storage and as the church guilds (similar to later friendly societies) developed was sometimes known as the Guildhall. When the town finally had its Mayor and Burgesses in 1705 they occasionally met in the Church Hall, referring to it as the Town Hall. However, they contributed little to the government of the town, leaving this to the churchwardens, but the 1485 Parvise over St John’s porch was used as the town’s muniment room and was fitted with locks for both the mayor and the churchwardens. In 1798 the churchwardens put up a “necessary house” in Hanover Square, redirecting some of the water from the conduit to it. In 1800 the half-timbered Church Hall was given a brick facade and it survived until 1865. The conduit was then removed and the Church House rebuilt. The new Vestry Hall (as it was then called) had provision for the new fire engine where the conduit had stood; it's blocked up entrance now forms the present bookshop's window. When Mendip District was created in 1973 it inherited the Vestry Hall from the borough and sold it. The early medieval market place extended from the Church House to the bottom of the High Street between the street and the Abbey’s north precinct wall (the other side of which were the women’s almshouses). By 1325 the market, already in existence for at least 135 years, was held every Tuesday with rents going to the Abbey, including leases for nine butchers’ stalls. This site was probably regarded as too valuable for this purpose and was later built upon long before the dissolution of the Abbey, the market being pushed into the Market Place and along Magdalene Street [where it again is]. The Abbot’s Court House was built in the original Market Place, alongside the High Street, and underneath it was an open area for stalls with the gaol at one end. In 1598, long after the power and wealth of the abbots had gone, an enquiry showed that the Court House was in decay. It was repaired by the Crown but by the middle of the 1640s it was again in ruin and was removed. 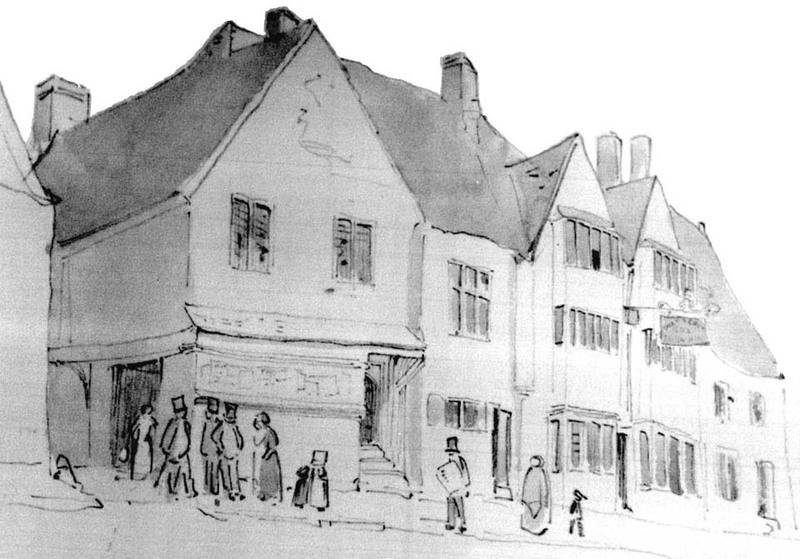 The likely site of the Court House was opposite the Tribunal where the White Hart Inn was built shortly after its destruction. This was the major post-medieval inn and was soon to become infamous when, in 1685, its inn sign was used to hang four of Monmouth’s rebels. It was the main inn for visitors to the Abbey ruins and the key coaching inn until it ceased trading with the arrival of the railway. The Inn was converted into shops and offices and the Assembly Rooms were built in its now redundant stable yard by Austin in 1864. Parliament carried out its responsibilities more effectively during the Commonwealth than under Charles and William Strode built a new Court House, presumably when the original one was destroyed in the 1640s. The replacement was in front of the Red Lion Inn (formerly one of the main Abbey gateways and now restored to that use). The new Court House arrangements must have been similar to those of the one it replaced; there were seven large windows on either side of the Court Room and underneath was an area for stalls entered through ten large arches. At the north end, towards the High Street, was the gaol. 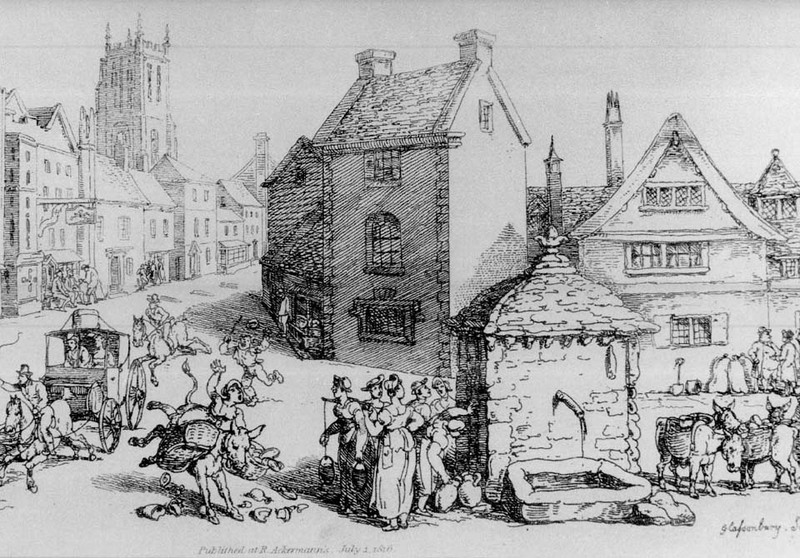 The success of the market declined—reputedly because Somerton also started a Tuesday market which became more popular. During the 18th century it was claimed that the decline was because the Market House had been built with materials from a part of the Abbey that was particularly venerated. The Court House was used for a while as a school and then, from 1794 to 1812 as a silk factory. 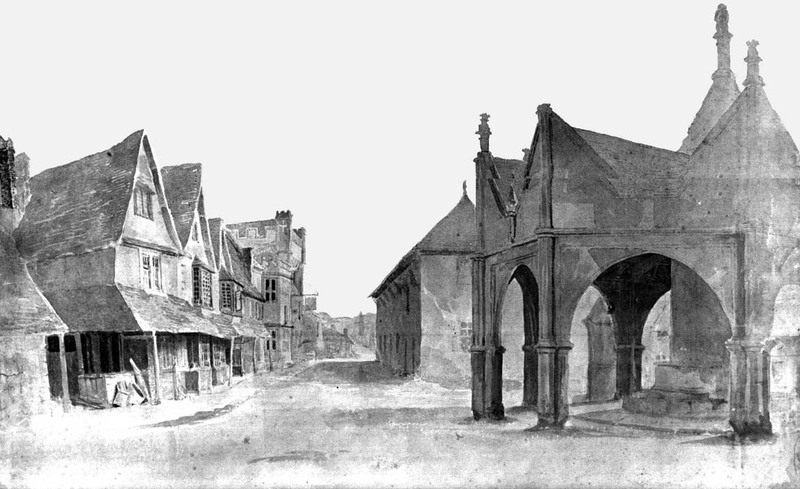 Only a narrow road had been left on either side of the Market House and when it was demolished in 1814 the Wells Turnpike bought a strip to widen Magdalene Street. The rest of the site was used by the borough as the site for a weighbridge which remained into the 20th century. 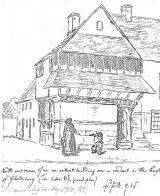 In 1814 the mayor and burgesses, having contributed hardly anything to the town in the century since their creation, decided to replace the Market House with a Town Hall. This more modest building was built at the side of Magdalene Street, almost alongside the site of the Market House. It had a council chamber above and a covered market below, entered through five open arches. Seventy years later the need for this space had gone and the ground floor was re-arranged in 1886 to create a museum for the newly formed Glastonbury Antiquarian Society. During the 1970s the borough created a car park out of the gardens north of the High Street, between the George Inn and St John’s church. This then housed the Tuesday market, which enjoyed a revival after its centuries of decline. 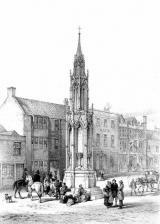 At the beginning of this century it moved back to the Market Place and Magdalene Street.